High-capacity cartridge for more frequent use. Premium supplies help keep your printer up and running for increased productivity. Cartridge generates optimum print quality. 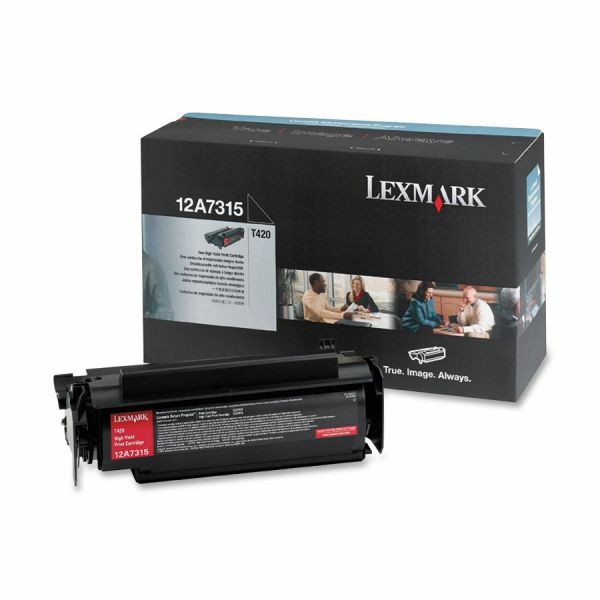 Lexmark 12A7315 Black High Yield Toner Cartridge - High-yield print cartridge is designed for use with the Lexmark T420d and T420dn. Superior Lexmark design means precision pairing between printer and cartridge for value, quality and environmental responsibility you can count on. Choose Genuine Lexmark supplies for genuine Lexmark results. Cartridge yields approximately 10,000 pages. High-quality supplies from printing industry. Lexmark warrants that on the date of original purchase this product will be free from defects in material or workmanship. If, during the warranty period, this product is found to be defective in material or workmanship, it will be exchanged, or repaired at Lexmark's option, with no additional charge. Warranty service does not include repair, or exchange when the problem results from accident, disaster, misuse, abuse, non-Lexmark modification (including refilling or remanufacturing), improper storage, malfunctioning equipment or normal wear and tear. Character or page yield is also not covered by warranty service, as it is influenced by customer application, printer contrast settings, operating environment, printer condition and paper type. To obtain warranty service you must, during the Warranty Period, return the Product, along with the proof of original purchase, to the place of original purchase. If it was purchased directly from Lexmark, you must return it to Lexmark to obtain warranty service. You must insure it or bear the risk of loss or damage in transit, prepay the shipping charges, and use the original shipping container or equivalent. Lexmark will pay return shipping charges within the United States and Puerto Rico. * Lifetime warranty does not apply to cartridges which have been refilled or to those which are simply empty as a result of normal use.